SCVHistory.com LW2998 | Lebec Area | Interrupted Mail: Letter (Envelope) Recovered from Fatal Plane Crash, 11-18-1930. Letter (Envelope) Recovered from Fatal Mail Plane Crash. 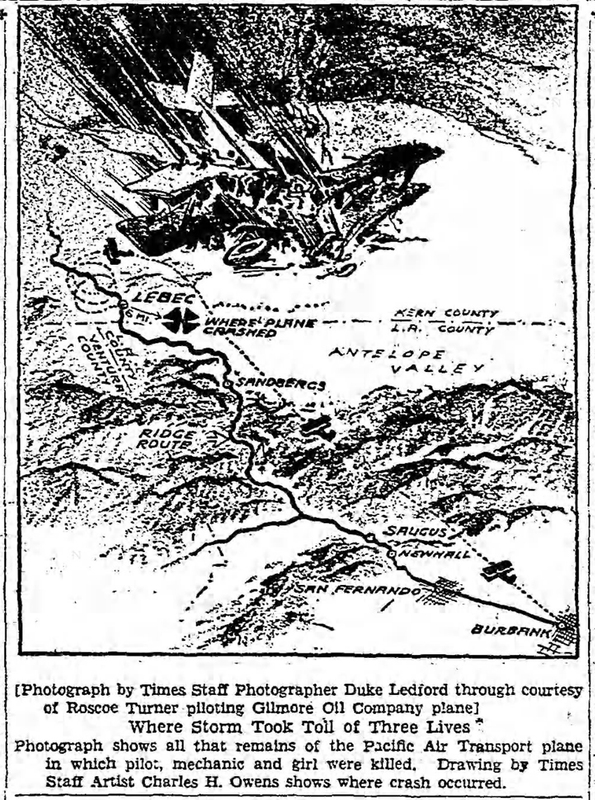 Lebec Area, November 18, 1930. Interrupted mail: Postmarked November 17, 1930, at Los Angeles, this letter was recovered from the wreckage of a northbound mail-and-passenger plane that crashed in the foothills of the Tehachapi Mountains six miles east of Gorman on November 18, 1930. All three persons on board died. They were the pilot, Flavius A. Donaldson of Burbank; George A. Rogers, the aircraft mechanic; and passenger Jean Markow, who was probably 18 years old. All of the mail survived. In this case, the correspondence was delivered to its destination in Portland; we have the envelope. It measures 10½x4½ inches. The back is blank. With 5 cents franking, this letter was sent from Security-First National Bank of Los Angeles, P.O. Box 160, Arcade Station, to the United States National Bank at Portland. This letter delayed in mails because of plane crash on northbound flite of P.A.T. plane on C.A.M. #8 route November 17th, 1930. The pilot F.A. Donaldson and two passengers being killed. The note is signed by the postmaster at Portland, J.M. Jones. C.A.M. is Contract Air Mail. The United States Postal Service contracted carrier routes to commercial airlines. P.A.T. 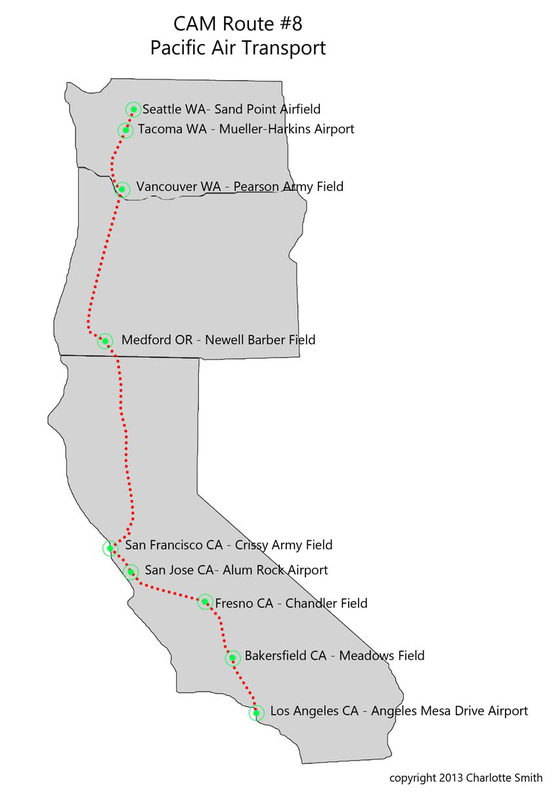 is Pacific Air Transport, the contractor for CAM Route 8. Three Bodies Taken from Wreckage of Lost Plane. Missing Air-Mail Craft Discovered Shattered on Foothill of Tehachapi Range. Inquest Today May Reveal Tragedy Cause. Ranger and Airman Find Fallen Craft. Crash Occurred Close to Emergency Field. Los Angeles Times | Thursday, November 20, 1930. Telescoped into a misshapen ball of wreckage, and with its three occupants dead, the missing Pacific Air Transport mail-and-passenger Boeing transport biplane, for which scores of other planes and hundreds of men afoot had been searching since early Tuesday, was found yesterday on the rolling rocky slopes of the Tehachapi foothills, about six miles east of Gormans [sic]. An ironical touch was lent the tragic discovery by the fact that the wreck's location is but a mile and a half, in a northerly direction, from the emergency airport established on the edge of Antelope Valley, following news of the plane's disappearance, and used since then as the base of searching operations. Putting the spurs to his mount. Newsom raced to the emergency airport and broke the news of his find. And a moment later Pilot Jack Parshall of P.A.T. set down his plane and confirmed the tragic message. He had observed the wreckage from the air at about the same time. Led by Thomas P. Hamilton, president of United Airports Company of California, a party went at once by automobile to the foothills, while Parshall, re-entering his ship, circled above and indicated the exact spot. Meantime, word of the discovery was flashed by radio to the twoscore planes which were searching vainly over the ridges and canyons miles away, and they converged to the area above the wrecked ship's resting-place. A number of them, in fact, ventured landings in the immediate vicinity, despite the undulating and rock-studded terrain. 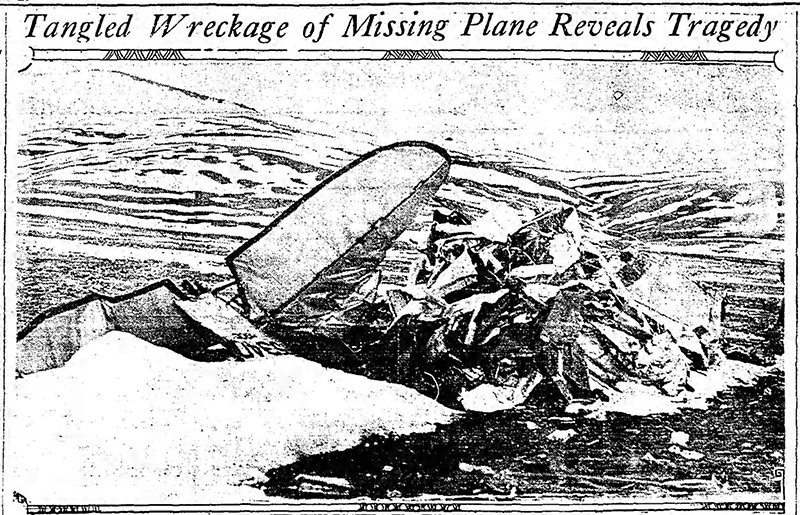 A careful examination of the wreckage revealed that the plane had struck nose first and plowed up the upward slope of the hill a distance of 150 feet. The heavy motor itself was a complete wreck, the cylinder heads having burst their bonds in the terrific impact with earth. The 319 pounds of mail the plane had been carrying to Oakland and Portland, however, was intact in its sacks. Five hundred feet from where the ship finally piled up a furrow in the ground indicated that it may have struck on one wing before hurtling forward on its nose, it was stated by R. Parish, one of the first to reach the scene. An aileron was found 500 feet away — evidently spun through space by the impact, Parish said. Several theories were advanced as to the cause of the fatal crack-up. Lieut. Fred Solter, pursuit pilot attached to the Eleventh Bombardment Group, Rockwell Field, San Diego, stated he believes the formation of ice on the wing surfaces of the plane was responsible for the crash. He was among those who flew over the scene and made an inspection of the wreckage. He pointed out that Donaldson's last radio report had complained he could not force his plane higher than 11,000 feet, whereas the Boeing ship normally should have been able to attain 15,000 feet. Donaldson's confessed inability to exceed 11,000 feet, therefore, according to the Army flyer, indicates that ice accumulated on his wings as he circled desperately above Lebec in the sleet and snow of Monday night's storm and thus reduced the ship's lifting power. The formation of ice, according to aeronautical theory, cuts down the necessary vacuum for lifting power by diverting the rush of air to the improper angle. Another airman theorized that Donaldson cracked up in spiraling downward with a view of seeking a landing spot, and that the extremely poor visibility cut off the view of the gently sloping hillsides. He probably believed, this pilot said, that he still was well over the floor of the Antelope Valley. A third theory ascribed the triple tragedy to a downdraft, the dread of all flying men. In the terrific gales prevailing Monday night and early Tuesday, it is quite possible such a draft may have caught the ship in its deadly grip and swirled it downward to destruction. At all events, it was agreed by all experts who inspected the wreck that Donaldson was on his course and headed northward. Only the darkness and accompanying storm contributed to the disaster, the pilots pointed out, for the numerous landings yesterday established that Donaldson could have come to earth with his craft safely under ordinary conditions. Shortly before sundown the bodies of Donaldson, Rogers and Miss Markow were removed to Bakersfield. There an inquest probably will determine the exact cause of the fatality. Why the wreckage was not sighted before Newsom stumbled upon it in his rounds was attributed by all searchers to the fact that it had never occurred to them Donaldson might have been seeking a landing in the valley. To a man they were of the belief he had come to grief in one of the many forbidding canyons of the Tehachapis, more to the westward, and it was in and over this part of the country that they concentrated their search. The discovery yesterday brought to an end a search that had endured for forty-three hours. Renewing the systematic search prosecuted Tuesday, the fleets of planes and hundreds of land searchers, set out at dawn again yesterday. In the sky were ten army Boeing pursuit planes, three twin-motored army bombers, one trimotored army Fokker, two Marine observation planes, three navy planes, and more than twenty commercial ships, all reconnoitering under the general supervision of P.D. Bush, Los Angeles division operations manager of P.A.T., and C.E. Johnson, Pacific Coast operations' director, basing at the Antelope Valley emergency field. The land crews were directed by President Hamilton of United Airports Company. During the day the search was spurred by the offer of $1,000 regard. The offer was posted by Hamilton and provided for the payment of $1,000 "to be paid the party or parties locating and first reaching the P.A.T. mail-and-passenger plane which has been lost in the mountains near Lebec since 2:07 a.m. Tuesday. Should more than one person actually locate or find the missing plane the reward will be divided evenly between the successful searchers." Fred Denslow, United Airport manager, announced the offer in behalf of Hamilton. Three women were in a state of collapse last night as a result of the tragedy. They are Mrs. Donaldson and Mrs. Rogers, wives of the pilot and mechanic, respectively, and Mrs. L.M. Schmidt of 905 South Schmidt, the lone passenger. Throughout the day both Mrs. Donaldson and Mrs. Rogers kept up a constant vigil in the P.A.T. offices at the United Airport, and a short time before the wreckage was found Mrs. Donaldson, unable longer to endure the suspense, asked to be driven to the Antelope Valley field. She received the news there and was flown back to the United Airport by Pilot E.L. Remlin. Pilot Donaldson lived at 1027 North Alameda street, Burbank, with his wife and widowed mother. He was born in Milford, Iowa. Known as "Putch" he started his career as an automobile racing driver and when he was 26 years of age, won a race in which his father, also a driver, was killed. With his three brothers, Grant, Orvllle and Louis, he later bought four airplanes and went on a barnstorming tour of the country. He had 600 hours in the air to his credit when he enlisted in the Army. On his discharge he resumed flying, as a commercial pilot, and came to Los Angeles on his honeymoon in 1924. He had a total of 4,900 hours in the air on his commercial flying record. Rogers, the dead mechanic, lived at 839 North Frederick avenue, Burbank. Besides his widow, he leaves a 5-year-old daughter, Joyce. Miss Schmidt, it was learned, at United Airport, had made numerous plane trips up and down the Coast. Her last began at San Diego Sunday night. She flew here, stopped over a day with her mother, and then boarded Donaldson's plane Monday night, bound for Portland, Or., to visit friends. Her mother tried unsuccessfully, she said, yesterday, to dissuade her from making the trip. While deploring the mishap to the Donaldson plane. Pacific Air Transport officials, in a statement made in Seattle, last night pointed with pardonable pride that since it began business three and a half years ago its planes had flown a total of 12,000,000 miles — half of them at night — with the loss by accident of only one pilot and three passengers. Until Donaldson's plane cracked up, the record was 7,000,000 miles flown with no fatality. Donaldson's brother, Grant, also a P.A.T. pilot, figured in a spectacular air crash October 2, 1928. Flying between Medford, Or., and Portland, at that time, he attempted to get under a fog in the pass between Glendale, Or., and Canyonville, and struck Canyon Mountain, shearing off the tree tops and piling up against a cliff. A passenger, B.P. Donovan of Los Angeles, was burned to death and Donaldson was burned seriously in an effort to rescue him and the mail. He spent nearly a year in the hospital. At present Grant is flying the San Jose-Oakland route, but was ordered here Tuesday to aid in the aerial search for his brother. Throttle Open as Plane Hits, Experts State. Pilot's Last Message Declared Story Of Disaster. Wedding Ring Found On Finger of Dead Girl. The Associated Press | As Published in the (Reno) Nevada State Journal, November 21, 1930. 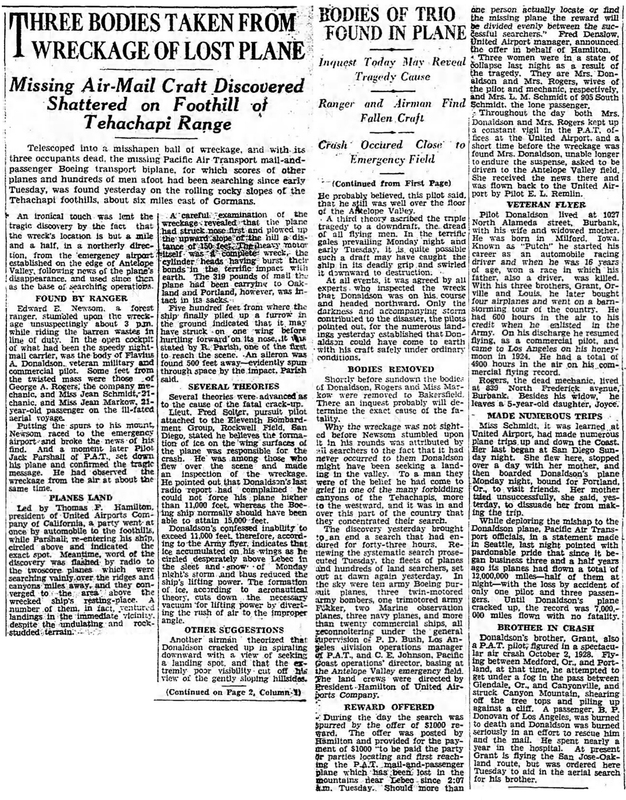 Burbank, Cal., Nov. 20 — (AP) — Four words, the last ever received from the radio of the night air mail plane which crashed in the Tehachapi foothills early Tuesday, killing its three occupants, revealed to experts today the explanation of the tragedy. The words were: "Do not know position." A coroner's inquest found the victims came to their deaths in an accidental plane crash, presumably shortly after the final message was received. The plane, federal postoffice authorities revealed, carried mail estimated to have been worth $200,000, all of which was recovered. Searchers found a package containing $75,000 in loose jewels, and another containing several thousands of dollars in securities in the wreckage. At an inquest conducted by Coroner Normand C. Howard in Bakersfield, a coroner's jury decided F.A. Donaldson, the pilot, Miss Jean Markow, 18, his passenger, and George Rogers, his mechanic, came to their deaths in an accidental plane crash. Deputy Sheriff Claude Morgan, assigned to the investigation to assist United States department of commerce aeronautics bureau representatives, said "the accident was unavoidable." "Donaldson had lost his bearings in the storm," Morgan said. "He plunged straight into the sloping plateau with the throttle wide open." The wreckage and the bodies were found yesterday after a 43-hour search. The plane was a mass of wreckage, but had not burned. The 319 pounds of mail it was carrying to Oakland and Portland, Ore., was found intact. Relatives of the victims, all of whom lived here, had not planned the funerals. Thomas Hamilton, president of the United Airport and an official of P.A.T., announced Ed Newson, cowboy, would be paid a $1,000 reward for locating the plane. A wedding ring was found on the finger of the girl. Arnold Hagenback, a friend, testified at the inquest he did not know whether she was married.